During the 19th century, many magnificent English landscape gardens were located within traveling distance from the center of London; because these British gardens were accessible by steamboat, omnibus or steam railroad, an English garden tour became a popular public attraction. The gardens were undulated with carriage drives around and through the grounds; with broad graveled walks in various directions, opening long vistas through well grown trees. Some trees stood in rows, but were generally irregularly planted with plenty of room for the full development of each and every tree. With these English garden photos, you will see magnificent gardens, such as Kew Gardens, with numerous varieties of trees, shrubs and herbaceous plants were plainly labeled. These photochrom color images provide a English garden photos tour of glorious 19th century gardens sprinkled throughout Great Britain. At some English landscape gardens, such as Kew Gardens, numerous varieties of trees, shrubs and herbaceous plants were plainly labeled. This series of English garden photos, featured at the Library of Congress, provides a glimpse of these magnificent landscaped treasures. Kensington Gardens, one of the Royal Parks featured in this English garden pictures series, has 275 acres of formal avenues of magnificent trees and ornamental flower beds. The English garden is located at Kensington Palace, the choice of William III and Mary II for their London home. Queen Victoria was born in Kensington Palace and lived there until she became queen in 1837. 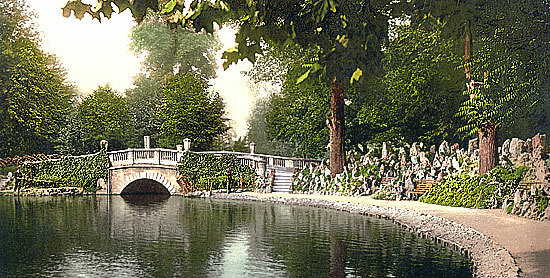 Queen Victoria commissioned the Italian Gardens and the Albert Memorial. Outside Kensington Palace stands a statue of Queen Victoria sculpted by her daughter, Princess Louise, to celebrate 50 years of her mother's reign. Our next stop on this English garden tour is the Valley Gardens in Harrogate, England -- listed as an English Heritage Grade II and cover 17 acres. They are famous for their mineral springs. Their noted historical structures, such as the Sun Pavilion and Colonnades still stand. Bournemouth, on our English landscape gardens photos tour, is a seaside resort in southern England. The city dates from 1810 but did not grow rapidly until the railway reached Bournemouth in 1870. In 1880, the population of this resort town was near 17,000, and then more than tripled by 1900. During the late Victorian era, Bournemouth was famous for its glass Winter Gardens, built in 1875 and the Theater Royal built in 1882. 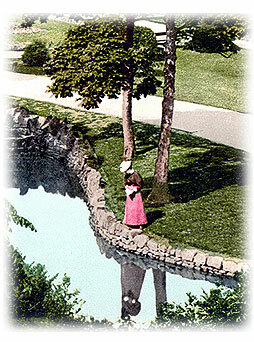 Another attraction was the Pleasure Gardens laid out in the 1870s. Kew Gardens, known today as the Royal Botanic Gardens, are located on the River Thames in southwest London, England. Kew Gardens was originally a private fruit and vegetable garden belonging to the Prince of Wales, the father of George III. The dowager princess of Wales, the mother of George III, began to improve it as a botanical garden and pleasure ground about 1760. Kew received additions from time to time, so that by the late nineteenth century it contained 270 acres. Kew Gardens became public in 1810 but suffered a decline from 1820-1840. 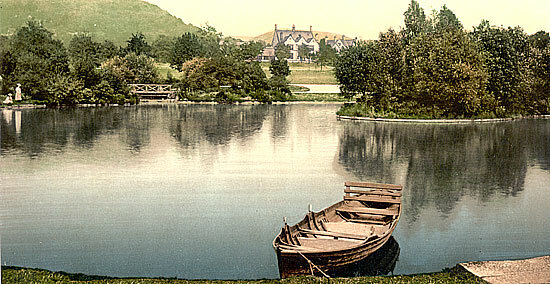 In 1840 the English landscape gardens were presented to the nation as a royal gift and placed under the control of Her Majesty’s office of public works. Seating arrangements add coziness of an indoor living-room to the charms of a Victorian style garden. Decorate your outdoor living area with Garden & Veranda Furniture styles from the past, featuring wrought iron table and bench designs. Under Queen Victoria’s patronage, Kew Gardens flourished and by the late nineteenth century, the Garden was said to be one of the finest and most complete botanical collection and arboretum in the world. 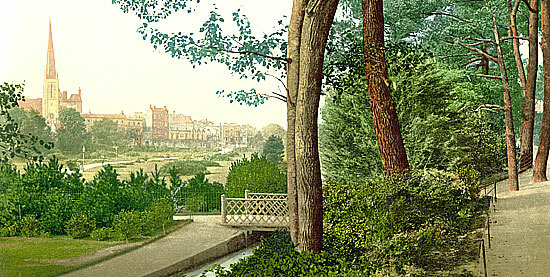 The land for the Victorian Borough Gardens, located near the center of Dorchester, was purchased in 1895. The center structure shown in the English landscape gardens is still used today.